She might have had an unconventional start to her journey as a Kathak dancer, but today, Jigyasa Giri is a name to reckon with in the field. A dancer, teacher and choreographer, her Kathak classes hold the distinction of not having an (upper) age limit for students to enroll, making her one of the most sought after teachers in the city today. Her dance school, Devaniya, was started in Chennai in 2009, and there has been no looking back for this danseuse ever since. Her passion does not end there. She is also the trustee and resource facilitator of a school, My School Sathya Surabhi, which provides quality and value-based education and nutritious noon meals for its students, who are primarily the children of farm labourers and petty vendors of Attuvampatti, Kodaikanal. Ahead of the Margazhi month, Jigyasa tells all about her journey in dance, how her gurus and how she came about to being a teacher in an interview with DC. The guru is all: “My first dance guru was Shri V. Krishnakumar, a truly gentle soul. His smile still lingers in my memory and as a dance teacher myself today, I owe him my lessons in patience and perseverance,” says this danseuse, who thinks she must have been his biggest challenge. “I was so stubborn about not wanting to learn. Slowly, I settled down and was under his tutelage for seven years.” It was during a summer vacation in Mumbai in 1980, that she happened to witness a Kathak performance, and that’s when she fell in love with it. 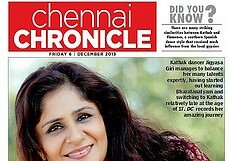 However, finding a Kathak guru in Chennai was almost impossible, she says. “My dear mother, the determined woman that she was, did find me my first Kathak teacher, Natyashree Sri Krishnakumar Dharwar. And thus began my Kathak lessons at home. He used to come home along with his friend and co-worker, a tabla player of repute, Shri Y. Satyanarayana. Guru Dharwar was prone to depression, and some days, he’d just sit and ask me to dance to a Meera bhajan, and that would elevate him. He started calling me ‘Meera’. He understood my soul space much before I did,” she says. Turning nostalgic she says that it was on his deathbed that he told her to teach Kathak. “With that, he sowed the most important seed of my future. He taught me above all to just love. If today, I love each and every student of mine, those are his teachings and gifts. Y. Satyanarayana who stood by him till the end, today, more than three decades later, continues to play the tabla and pakhawaj at Devaniya.” In 2002, much after she started teaching Kathak in Chennai, she yearned to be a student once again. “I wrote to guru Dr Maya Rao in Bengaluru who agreed to teach me. She is a treasure trove of knowledge. She taught me how to let go in choreography. Whenever I have a doubt she is just an affectionate phone call away,” she says fondly. From a shishya to a guru: Although she is well-established as a teacher of dance now, Jigyasa did not take her Kathak guru’s words seriously when he said that she should teach. She says, “It never was my plan, but perhaps it was my calling. Many years after my guru died, I was in Bangkok where I received my first opportunity to teach dance to children of members of the Indian Women’s Association. It was years later, after I settled back in Chennai that I started teaching seriously. I began about 15 years ago with four or five students and zero experience in teaching. It has since been a most beautiful journey of learning to teach, of teaching and of continuing to learn and grow. In 2009, with the help of friend and guide, Dr Pratibha Jain, I formalised my dance school.” Devaniya, or ‘that which is divine’, Jigyasa says, is named after her mother Devayani and her grandmother-in-law, Vani Bai, who were both ardent patrons of classical dance and music. Today, Devaniya has over 175 students, ranging from eight-year-olds to senior citizens. “My ethos is simple — anyone who has the passion to learn deserves to have the opportunity. Not everyone can become a performer, but everyone has a right to learn at any age. It doesn’t matter if one is not as graceful, quick on the uptake or as rhythmic as the other. Dancing is a spiritual process for some, an energetic process of some, a slow process for some. Her only requirement is that they ‘want’ to learn.” says Jigyasa. 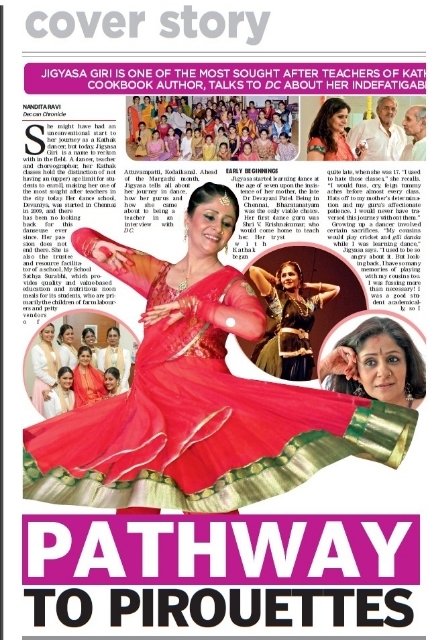 Scope for Kathak in Chennai, the hub of Bharatanatyam: “Each dance form has to evolve and there is space for everyone. 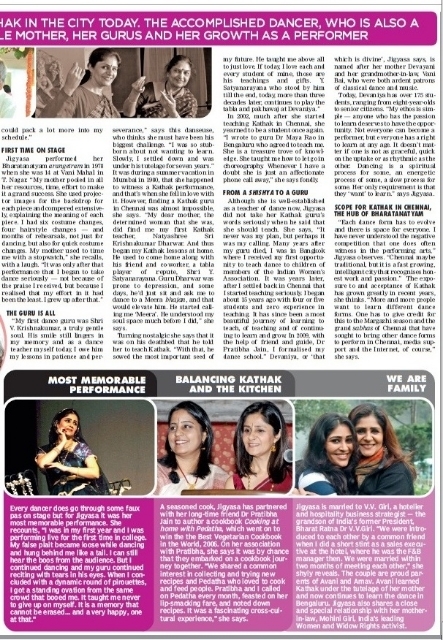 I have never understood the negative competition that one does often witness in the performing arts,” Jigyasa observes. 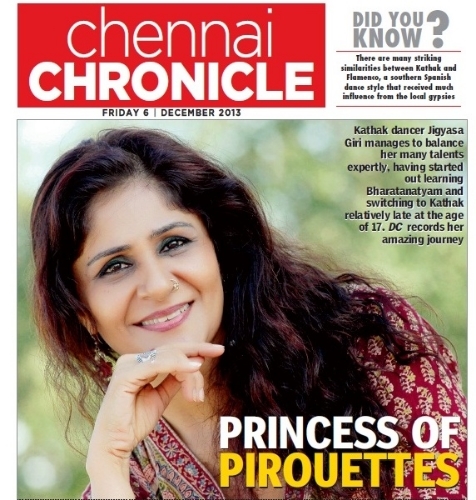 “Chennai maybe traditional, but it is a fast growing, intelligent city that recognises honest work and passion.” The exposure to and acceptance of Kathak has grown greatly in recent years, she thinks. “More and more people want to learn different dance forms. One has to give credit for this to the Margazhi season and the grand sabhas of Chennai that have sought to bring other dance forms to perform in Chennai, media support and the Internet, of course,” she says. Happy mornings! Really felt happy on going through the journey of yours. I felt born human means – to achieve something. Ek chhaya chod ke jaana. Also I saw the pictures of ARPAN. So beautiful. so nice. God Bless you and your family.